Parking.com has convenient parking near New York Penn Station. Click on a location name listed in the map below for hourly/monthly parking rates, garage information, or discount coupons. Please note: Customers must present coupon at time of exit to redeem discount. New York Penn Station is an underground train station located between Seventh Avenue and Eighth Avenue and between 31st and 34th Streets, underneath Madison Square Garden. The train station offers connection to Amtrak, New Jersey Transit, and Long Island Railroad trains, and subway service on the A,C,E,1,2, and 3 lines. 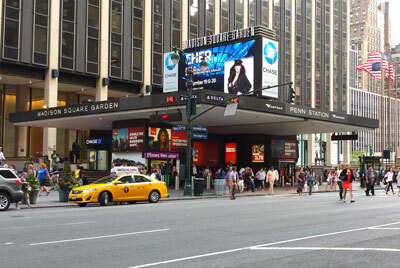 Penn Station is located in Midtown Manhattan close to many popular NYC attractions, including: Macy's Herald Square, Empire State Building, and Times Square.